In last month’s Trail Bytes, I mentioned that Boy Scout Troop #8880, in Canton, Georgia, asked me if I could dehydrate Jell-O or pancakes. This month I take up the pancake challenge. I make pancakes from scratch almost every Sunday. It is a little tradition Dominique and I started soon after we got married. We like our pancakes best with two bananas mixed in, plus cooked apples and apricots on the side. 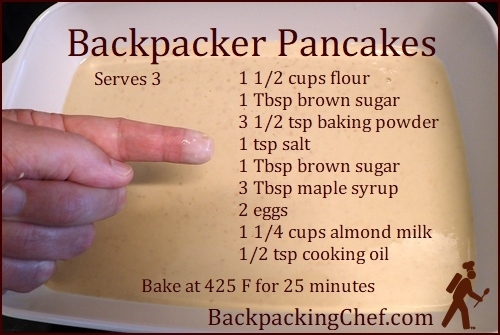 On backpacking trips, I never seriously considered mixing up batter and cooking one pancake at a time in the little fry pan lid of my Evernew pot. That's too much trouble for little gain. But what if I could make and dehydrate pancakes at home, and then simply heat and rehydrate them on the trail with an accompanying fruit in a pot? All it would take would be a few modifications to my usual list of ingredients. To avoid the possibility of dairy spoilage, I omitted the customary three tablespoons of melted butter, and I substituted almond milk for regular milk. I also omitted fruit from the batter, because fruit takes longer to dry than starch. In order to use less oil, I did not fry the pancakes in a pan. I baked them instead. Yield: This recipe will serve three people the equivalent of four pancakes each. 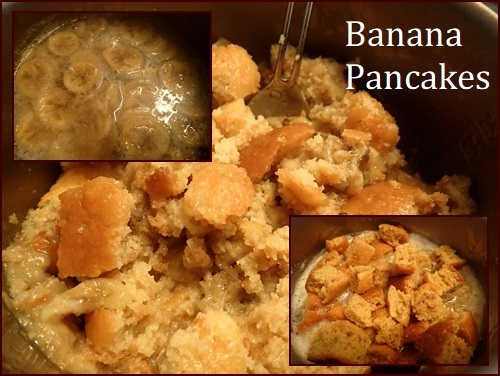 Ingredients: 1½ cups flour, 1 Tbsp brown sugar, 3½ tsp baking powder, 1 tsp salt, 3 Tbsp maple syrup, 2 eggs, 1¼ cups almond milk, ½ tsp cooking oil (to coat baking dish). Preheat oven to 425° F (220° C). 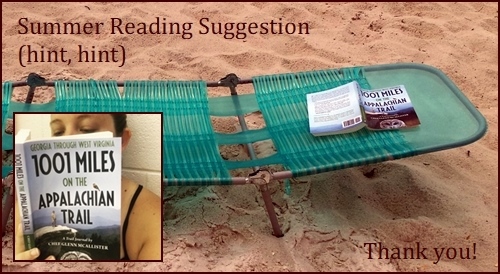 Use middle rack. Combine the dry ingredients and then whisk in the wet ingredients except for the oil. 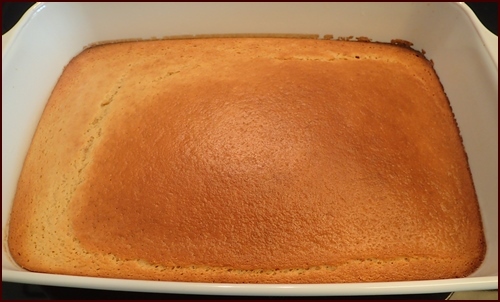 Coat the bottom and sides of a baking dish (12” x 8” interior) with ½ a teaspoon of cooking oil, and then pour in the batter. The batter should be about half an inch deep. Bake the pancake batter at 425° F (220° C) for twenty-five minutes. The top, bottom, and sides will turn a lovely shade of light brown—just like perfectly cooked pancakes. Remove baking dish from oven when done, let cool, and then cut pancakes into cubes about an inch thick. Start by cutting six sections out of the dish, and then cut the sections into smaller cubes. Dehydrate at 135° F (57° C) for approximately four hours until completely dry. 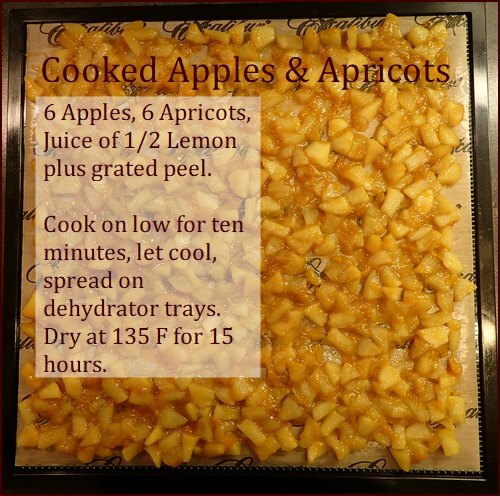 This recipe fit on one Excalibur Dehydrator tray with a little room to spare. 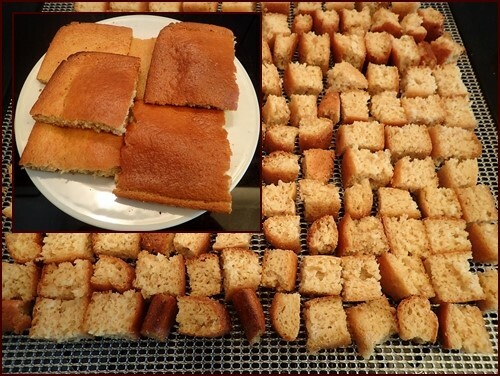 Photo above shows the pancake cubes after they were dehydrated. Photo above shows the fruit that I dried separately: blueberries, bananas, and cooked apples and apricots. Pack for trip: For one serving, pack 50 grams dried fruit and 100 grams dried pancake cubes in separate bags. Photo above shows 50 grams of fruit (dried apples and apricots) and 100 grams of dried pancake cubes. Because the pancake cubes are bulky, it is more precise to measure by weight, rather than volume, to pack the meal. Conversions: Fruit: 50 grams = 1.75 oz., approximately ¾ cup. Pancakes: 100 grams = 3.5 oz., approximately 1½ cups. 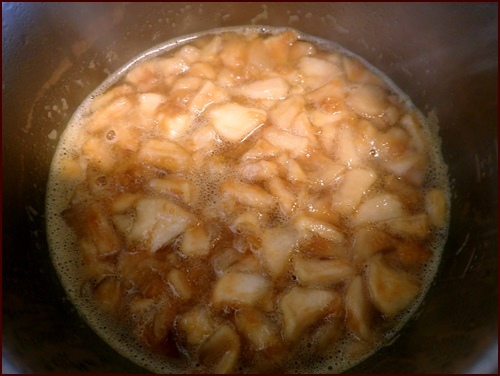 Photo above shows dried apples and apricots simmering in a backpacking pot before the pancake cubes were added. Step One: Place dried fruit in pot with 1¼ cups water. (3 dl) Let sit for five minutes and light stove. Bring to a boil. Step Two: Add pancake cubes on top of cooking fruit. Do not stir pancakes into the fruit yet. With lid on pot, continue cooking for another minute. Step Three: Turn off stove, stir pancake cubes and fruit together in pot, replace lid. Wait five minutes. I recommend using a pot cozy to keep your pancakes nice and hot. Step Four: Bon appétit! Sprinkle with cinnamon and maple sugar if desired. Pecan or walnut pieces might be nice too. Photo above shows the fruit (apples and apricots) and pancakes mixed together. 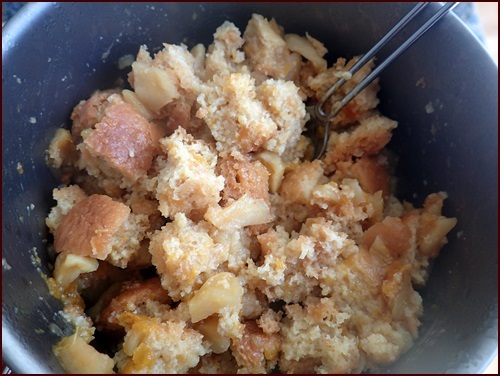 The photo above shows how I made the apple-apricot mix. Since it was drying slowly, I ended up transferring half of the contents to a second tray. We usually serve this on the side at home. The next time Dominique and I hit the trail, I will make the banana pancakes and rehydrate a side of apples and apricots in my Thermos food jar. Are these backpacker pancakes just like pancakes fresh out of the pan? Not exactly. 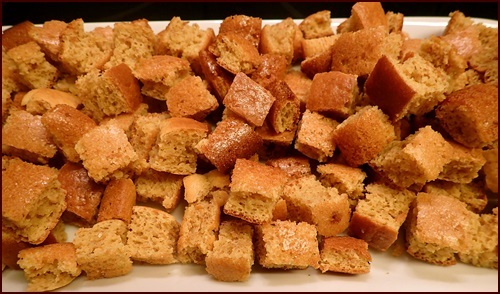 The texture is a little different; some cubes may be slightly chewier, but they are tasty and easy to prepare on the trail, which earns them a place in my breakfast menu rotation. Because the pancakes contain cooked eggs (fat in yolk), I don't recommend them for long term storage. But they will keep well for a couple of weeks, and longer if vacuum sealed. Let me know if you try them. Order yours today. They're selling like hotcakes.